Stinging nettle is my favourite spring food. Not because I know how nutritious it is, but because it is the most delicious of all greens. Each spring I check its usual spot on my property, impatiently waiting for it to emerge and to grow big enough to be harvested for a soup. When tender green shoots are about 5 -7 inches big, they are ready. Nettle stings. I, personally, do not care much. Its stings are not that terrible in the first place and itching goes away very quickly. But before you find out how sensitive you are to nettle’s sting, better use garden gloves or rubber gloves. Also, do not pull it, rather cut it about an inch above the ground. Pulling would damage the roots and slow down the re-growth. Wash nettle carefully under running water (again, use rubber gloves to be on a safe side). Before chopping, place it briefly into boiling water or simply leave it in a colander and poor enough hot (boiling) water over it to make soft. After that nettle is safe to handle with bare hands. Peel potatoes, cut them into cubes. Place diced potatoes in a soup pot, fill with cold water, bring to boil. Add salt to taste and a dash of black pepper. Meanwhile brush carrots, pat dry and cut them to small pieces. On a small skillet warm ghee over medium heat, add carrots. Stirring once in a while, sear carrots for a few minutes until all the pieces are evenly brown. Add to the soup pot and cook together with potatoes until tender. When both carrots and potatoes are ready, add chopped nettle to the pot. After the soup returns to boiling, cook it for another 5-7 minutes. Remove the soup from heat, add freshly squeezed lemon juice, stir well. 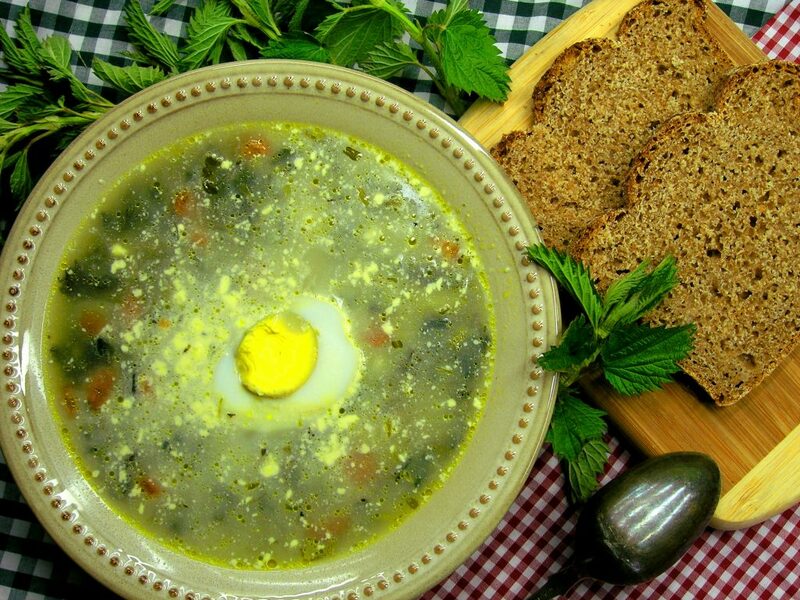 Your Spring Nettle Soup is ready! Garnish it with a teaspoon of Homemade Mayonnaise or sour cream and add a half of a hard boiled egg ( chopped or whole) to each plate.